(Stillness in the Storm) The Schumann Resonance is one of the hot topics in the awakening community. It has become an indicator for our progression towards a better world, but how is this the case, and how does it affect consciousness? The following article details the hard science behind these interactions of the Sun, atmosphere and Earth. A standing wave is a scalar or self organized wave form that ‘stays still’ in relation to a point of view or reference point – we normally think of waves moving from a source to other locations. Standing waves are created by reflecting energy from a source, off a surface, creating an interference pattern – with places of high intensity energy to places of little or no energy; stillness. The Earth and Atmosphere is one such system for creating standing waves of various types: storms, tornadoes, hurricanes and volcanos. On a macroscopic scale, we have: living systems, fresh water springs and ‘vortex points’. Life tends to grow best when the Electromagnetic wave forms are harmonically inclusive, meaning there is a large number of frequencies that harmonizes with each other – making ‘music’. The Sun acts as the main source of energy charging the Atmosphere and Earth as a resonating chamber. Our bodies are capable of acting as focal points for this energy organization based on over all health and our mental processes; literally how we define our experiences subjectively. When we ‘find a good spot’ and our bodies are tuned properly, they can literally ‘charge up’ from sun gazing and Earthing; we become self similar or fractal standing waves; we create a stillness in the storm of our bodies. And this is the basis for much of the paranormal activity throughout the planet: Crop Circles, Ley Lines, Vortexes and Star Gates. Mental entrainment, or synchronization, usually achieved by meditation and gratitude practices, literally reflect the world with-out inside of us more clearly, this creates a flow of emotional energy within the body, affecting our genetic expression and DNA geometry. Bliss experiences are an indication of mental synchronization (truth receptivity) and the feelings one gets as a result of them is the influx of charge from the senses, flowing back out as heightened and coherent emotional states. Hence Energetic Evolution is the process of making our mental patterns more coherent (gaining accurate knowledge) which changes our emotional states to positive, changing our electromagnetic capacity to store the coherent energy from the Earth, Sun and Galaxy system. Dan Winter covers this extensively here. “So you think, so you feel, so you act” – Echoed by Mark Passio. Our belief systems, world views and conclusions about life literally determine our emotional states and whether our bodies create self similar bliss experiences or chaotic states of fear. According to many researchers, there are ‘aetheric’ parasites which can feed off of our fearful energy, which we now have a scientific basis for understanding. Essentially, we either learn to reconcile and organize our beliefs into a unified system of understanding, creating a coherent Aura, or we become dependent on externalizations (drugs, other people, society, etc) that cause increasing levels of disease. The fact that the vast majority of people are dependent on society and work as debt slaves slowly destroying themselves due to life habits, is a tangible example of how underdeveloped personalities can be taken advantage of by other people; the Cabal or banking elite. Our mind, body and spirit activities will either enable us to be more free and independent or more dependent and limited; sovereignty vs slavery. This is not some airy fair New Age concept, the hard science for these realities are described herein. And it is an essential stage in our process of gaining real sovereignty to go within and transmute any such limiting belief systems into holistic reflections of what is; the process of forgiveness married with the search for wisdom or true knowledge. a place within the medium being vibrated that stays still. Earthing or grounding, electrically is one powerful way to restore health, when coupled with sun gazing and eating raw organically grown food. But why do these things affect our health? Dan Winter is an electrical engineer who has delved deeply into these topics and covers them in his presentation: Science Of Ascension, Evolution and much more | Fractality: What Makes a LIVE ENZYME – Alive? with Dan Winter. The key concepts behind why Earthing is so healthy, and why living in cities and improperly built houses can be detrimental is entrainment or synchronization; a process of reorganizing the electro-magnetic states of our bodies. When two surfaces come into contact they equalize at a point of flow; plasma known as lightning with respect to the Atmosphere and Earth. Our bodies are a form of living plasma in a sense, hence the term life plasum spoken of in some works. When we go to places on the Earth’s surface with a high degree of electromagnetic coherence, like Energy Vortex centers found in natural settings (Mount Shasta), our bodies synchronize to them, and as a result our minds and emotional patterns. The body is a living dynamic system of moving energy, and can be measured scientifically as part of the holistic system of the Earth, Sun and Galaxy. This means we synchronize to our environment – if our environment is electromagnetically toxic, like in a city or building, we entrain to that. Conversely if we go into a healthy area, living systems such as nature or ground regularly into the Earth, the effect is reversed – becoming healthy and up-stepped in mind, body and spirit. What is being revealed here is this core aspect to the universe of synchronization, or entrainment. Our bodies, minds and souls are linked to all that IS. This provides a very real scientific basis for an energetic evolution, the so called ascension scenario talked of by many researchers, as well as the spherical shape of the Earth. If the energetic properties of the Sun change, increasing in output and frequency range intensity, so will the Atmosphere and Earth by proximity. And the storms of lighting that are the living organisms dwelling on and in the Earth will similarly be affected. (Aether Force) The Earth behaves like an enormous electric circuit. The atmosphere is actually a weak conductor and if there were no sources of charge, its existing electric charge would diffuse away in about 10 minutes. There is a ‘cavity’ defined by the surface of the Earth and the inner edge of the ionosphere 55 kilometers up. At any moment, the total charge residing in this cavity is 500,000 Coulombs. There is a vertical current flow between the ground and the ionosphere of 1 – 3 x 10^-12 Amperes per square meter. The resistance of the atmosphere is 200 Ohms. The voltage potential is 200,000 Volts. There are about 1000 lightning storms at any given moment worldwide. Each produces 0.5 to 1 Ampere and these collectively account for the measured current flow in the Earth’s ‘electromagnetic’ cavity. The Schumann Resonances are quasi standing wave electromagnetic waves that exist in this cavity. Like waves on a spring, they are not present all the time, but have to be ‘excited’ to be observed. They are not caused by anything internal to the Earth, its crust or its core. They seem to be related to electrical activity in the atmosphere, particularly during times of intense lightning activity. They occur at several frequencies between 6 and 50 cycles per second; specifically 7.8, 14, 20, 26, 33, 39 and 45 Hertz, with a daily variation of about +/- 0.5 Hertz. So long as the properties of Earth’s electromagnetic cavity remains about the same, these frequencies remain the same. Presumably there is some change due to the solar sunspot cycle as the Earth’s ionosphere changes in response to the 11-year cycle of solar activity. Schumann resonances are most easily seen between 2000 and 2200 UT. 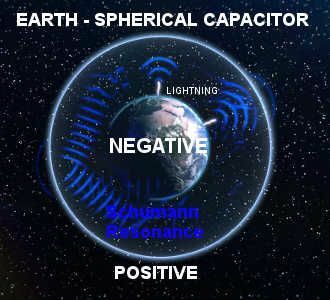 When we consider that the ionosphere surrounding our planet is electrically positive charged whilst the earth’s surface carries a negative charge, we must conclude that this amounts to a prevailing electrical tension within the earth/ionosphere cavity. This tension is discharged when thunderstorms develop in this cavity. In physics two concentric electrically charged balls, one placed inside the other, are called ball condensers, or capacitors. The inside of the ionosphere layer is used in wireless information transfer to bounce off radio waves emitted by transmitters on the earth’s surface. In this way the information can be transferred over large distances. The physicist and inventor Nikola Tesla was the first to carry out wireless energy experiments at Colorado Springs, USA, which produced such powerful electrical tensions that they resulted in the creation of artificial lightning. These lightning flashes also produced radio waves. Due to their extremely low frequency these waves could penetrate the earth without resistance and thereby Tesla discovered the resonance frequency of the earth. Unfortunately Tesla was way ahead of his time and his discoveries were not taken seriously because it suggested free energy for all and was not good for ‘business’. It wasn’t until more than half a century later in 1952, when the German physicist Professor W.O.Schumann of the Technical University of Munich predicted that there are electromagnetic standing waves in the atmosphere, within the cavity formed by the surface of the earth and the ionosphere. This came about by Schumann teaching his students about the physics of electricity. During a lesson about ball condensers he asked them to calculate the frequency between the inner and outer ball, meaning the earth and ionosphere layer. They came up with a calculation of 10Hz. It was Dr Wolfgang Ludwig who carried out further measurements whilst writing his thesis on the Schumann Resonance. His aim was to measure what kind of natural signals actually exist in a healthy environment. He became aware of the fact that due to man made electromagnetic signals within the atmosphere, the accurate measurement of Schumann waves was almost impossible in the city. For this reason he decided to take measurements out at sea where, due to good electrical conductivity, the Schumann waves are stronger. He than had the idea to take underground measurements in mines. Here he recognized that the magnetic field of the earth fluctuated too. This was also investigated by Dr Robert Becker in his book `Electricity and Vitality: The spark of Life’. Dr Ludwig came up with an excellent idea to take accurate measurements. When taking measurements at the earth’s surface, the reading is the result of two signals, one coming from above and one from below. But subsequently taking measurements below ground makes it possible to come up with exact readings by separating the two. 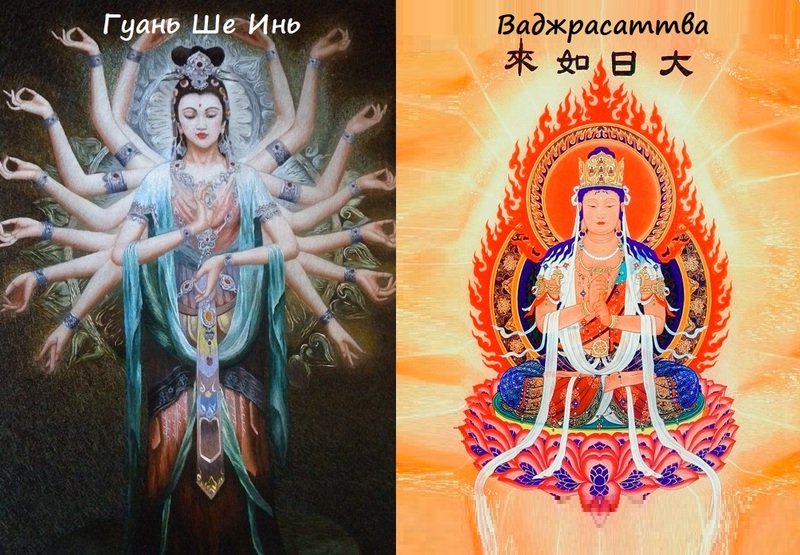 The Chinese teachings state that to achieve perfect health, both signals must be in balance. Dr Ludwig found that this is indeed the case. He writes in his book `Informative Medizin’ that research carried out by E.Jacobi at the University of Duesseldorf showed that the one sided use of Schumann (YANG) wave simulation without the geomagnetic (YIN) signal caused serious health problems. On the other hand, the absence of Schumann waves creates a similar situation. Professor R.Wever from the Max Planck Institute for Behavioral Physiology in Erling-Andechs, built an underground bunker which completely screened out magnetic fields. Student volunteers lived there for four weeks in this hermetically sealed environment. Professor Wever noted that the student’s circadian rhythms diverged and that they suffered emotional distress and migraine headaches. As they were young and healthy, no serious health conditions arose, which would not have been the case with older people or people with a compromised immune system. After only a brief exposure to 7.8 Hz (the very frequency which had been screened out), the volunteers health stabilized again. Through his work, Gregg Braden shares scientific proof of the Earth passing through the Photon Belt and the slowing of the Earth’s rotation. At the same time there is an increase in the resonant frequency of the Earth (Schumann Resonance). When the Earth stops its rotation and the resonant frequency reaches 13 cycles we will be at azero point magnetic field. In 2 or 3 days it will start turning again in the opposite direction. This will produce a reversal in the magnetic fields around the earth and so forth.